2.Wild Caught Ahi Yellowfin Tuna Loin Steaks – Sashimi Grade! 3.Wild Caught Jumbo Red King Crab Legs $32.99 lb – and we mean jumbo! 3.All Natural Boneless Pork Loin Roast $2.79 lb – Great on the Grill! 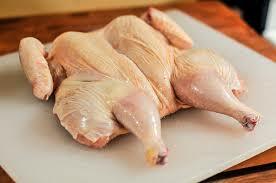 A whole chicken grills so much quicker and the meat cooks evenly if it is butterflied and lies flat on the grill. Following are instructions on how to do this. Or you can have one of Mert’s meat cutters butterfly it before you leave the store. Step 1: Remove neck and giblets from the cavity of the whole chicken. Step 2: Place the chicken on a cutting board breast-side-down. Working from the cavity opening up to the neck, cut down each side of the back bone with a pair of kitchen shears. Discard the backbone. Grab the chicken with one breast in each hand and open it like a book, exposing the cavity of the bird. The breast bones should crack a bit – that’s totally normal. Step 3: Running from the middle of the bird down between the two legs is a soft bone – this is the breast bone. It’s a triangular shape that is firm towards the middle of the bird and becomes softer cartilage as it tapers down between the legs. To remove it, use a paring knife to cut down either side of it. Step 4: Once you’ve cut it free, use your fingers to simply pull out the breast bone. Discard the bone. 1.Farm Raised In-Shell Little Neck Clams – Fresh! In a small bowl, combine the pineapple juice (or alternative juice), soy sauce, horseradish, parsley, 3 teaspoons of the sesame oil, honey and ground black pepper. Pour 2/3 cup marinade into a large resealable plastic bag; add salmon and green onions. Seal bag and turn to coat; refrigerate for 1 to 1 ½ hours, turning occasionally. Add remaining sesame oil to remaining marinade. Cover and refrigerate for basting. Drain fish and discard marinade. Preheat grill to medium high heat. Lightly oil the grill rack to prevent sticking. Grill salmon, skin side down, covered, over medium heat for 8 to 12 minutes or until fish flakes easily with a fork, basting frequently with reserved marinade. Remove tuna from bag; sprinkle with salt and pepper. Drain and discard marinade. Lightly oil grill great with cooking oil to prevent sticking. Grill tuna, covered, for 3 to 4 minutes on each side for medium-rare or until slightly pink in the center. 2.Wild Caught Soft Shell Crabs – Fresh! 3.Farm Raised Canadian P.E.I. Blue Mussels 2 lb bags – Fresh! 4.Wild Caught Ahi Yellowfin Tuna Loin Steaks – Sashimi Grade! 5.Farm Raised U.K. Scottish Black Pearl Salmon Fillets – Fresh! Sashimi Grade! 6.Wild Caught Alaskan Copper River Sockeye Salmon Fillets – Fresh! 7.Farm Raised Rainbow Trout Fillets – Fresh! Chicken Leg Quarters this weekend through Monday, 5/29/17 – stock up for Memorial Day Weekend grilling!